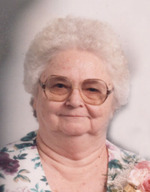 Maxine E. Shaw, age 84, of Sardis Ohio died Wednesday December 19, 2012 at Reynolds Memorial Hospital Glen Dale, West Virginia. She was born in Monroe County Ohio March 10, 1928 a daughter of the late Clinton & Clara Feiben Gray. She was preceded in death by her husband of 60 years; Virgil E. Shaw in 2007, daughter; Sandy Bentz in 2010, grandson; Chase Cook in 2011, a great grandson; Jayden LaCourse, and two brothers. 10 Grandchildren, 16 Great Grandchildren, 5 Great-Great Grandchildren. Friends received from (4-8) p.m. Friday December 21, 2012, and from 12 noon until time of Funeral Service at 2 p.m. Saturday December 22, 2012 at the Bauer-Turner Funeral Home 100 S. Paul St. Woodsfield, Ohio with Rev. Darla Schnegg officiating. Interment in the West Union Cemetery near Sardis, Ohio.